What time of day is best for science? When I was involved in a reading project and visited classrooms of participating teachers, it was common for reading and math to be scheduled in the morning. The thought was that students would be fresher and more focused for these “skill” subjects (and we all know these are the tested subjects!). But like you I wondered if science, social studies, art, and music would also benefit from this perceived early morning freshness and focus. This topic was discussed in a recent NSTA discussion forum, too. Some contributors noted that the morning was better for science because students were more alert, while others suggested that the hands-on, interactive nature of science investigations were perfect for the afternoon hours. In addition to the time of day, another consideration would be the quality of the science lessons. A thought-provoking investigation, project, or discussion may engage students whatever time of day, while a worksheet or lecture may turn kids off no matter when it happens. 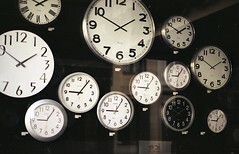 It would be interesting to see formal research studies on the optimal time of day for learning in different subjects. Assuming your administrators are cooperative, you and your colleagues have an opportunity to conduct your own action research on the topic. By analyzing and reflecting on data from your own classrooms, you can develop effective strategies for your students. Identify and fine-tune a focus area or research questions. How does the time of day affect learning in science? Some other related questions could include: Do some students perform differently in science depending on the time of day? Is there any difference in terms of gender, age, or type of activity? Design a strategy and collect data. Set up a schedule in which students have science some days in the morning and other days in the afternoons. If other teachers are interested, you could expand the study to include other grade levels or subject areas. Note the kind of activity being done (investigation, group work, paper-and-pencil activity, simulations, video, etc.) and observe the students as they work. Describe their engagement in the activity. Describe their physical activity and their conversations. Summarize the types of conversations students have. Use formative evaluation strategies to check on the content and skills students are learning. Analyze and interpret the data. Examine your observations. Look for patterns and differences. Does there appear to be a difference in assessment scores between the two time periods? Are there differences in the level of student engagement and types of student interactions? You’ll also want to debrief with the students on their perceptions, insights, or feelings about the switch in schedule. Develop an action plan. Depending on your results you may decide to stay with your current schedule, change it, or have an alternating schedule. Making any changes should involve your administrator and an awareness of how “specials” are scheduled. You could also study ways to fine tune the scheduling. For example, in the discussion forum, a teacher noted when science was scheduled first thing in the morning or right after lunch or recess, it helped students to refocus if the teacher did a read aloud on the topic before starting the activity. I’m glad to hear that your school does schedule science every day! In many elementary schools, science and social studies appear to be less emphasized, in favor of reading and math. Students are losing an opportunity to use and apply what they learn in math and reading to other content areas. And most students really enjoy science. This entry was posted in Ask a Mentor and tagged elementary, scheduling. Bookmark the permalink. Trackbacks are closed, but you can post a comment.